The author is fairly active on the world wide web and this book has been announced for a while. Harrison has been working on it for some time too, so I expected quite a book. “The Lost Rites And Rituals Of Freemasonry” proves to be a small publication though, under 150 pages of text. 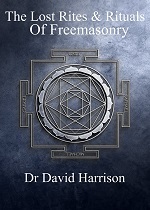 The author is a British Freemason who writes a lot about that subject, usually from a historical perspective. His latest book is largely historical too. The description it tempting. The book would cover strange, obscure and abandoned Masonic Rites including the systems of Willermoz, Von Hund and the like, about which there is not much information in English. With the limited number of pages, you can imagine that the book is not really in depth. Harrison starts with the most interesting part, the more exotic ‘high grade’ systems that arose in the time with a peak in occult interests. Here you can read about the likes of Cagliostro, Martinez de Pasqually, Willermoz and Von Hund. A large part of the book is about the variety of Rites that existed in Britain. When the Grand Lodge of London was founded in 1717 another Grand Lodge arose calling themselves “Antient” (and the other “Modern”) and it took until 1813 before these two Grand Lodges merged into the United Grand Lodge of England. There were differences between the rituals of the Antients and the Moderns, but since it was forbidden to print rituals, many local variations came up, sometimes with “pre-union” elements. Now that the number of members is going down, lodges merge or disappear, many of these local variations also disappear and Harrison mentions a lot of them. Only here and there he shows the differences though. The information is mostly historical. The last part is about Rites that go back to old (and exotic) Rites or persons, such as the Swedenborgian Rite with which Emmanual Swedenborg himself had nothing to do. Also there is a part about symbols that went out of use after the union of the two British Grand Lodges. “The Lost Rites And Rituals Of Freemasonry” makes a nice read and gives a good idea of the ‘experimental period’ of Freemasonry to the English speaking audience. It would have benefited from more detail though. It is clear that the author studied many Rites, such as the handwritten texts of John Yarker, but shows this only only a few occasions. As the book is now, it is mostly a general introduction to the subject, but not the study book that it is suggested to be.